A master alarm onboard Atlantis woke the crew from their sleep, after a General Purpose Computer (GPC-4) suffered a problem. The issue follows the failure – and subsequent recovery – of GPC-3 earlier in the mission. Meanwhile, the Damage Assessment Team (DAT) provided their full review of the orbiter’s Thermal Protection System (TPS), which has been cleared for Entry. The crew had entered their sleep period between Flight Day 7 and 8, when Atlantis annunciated the problem with GPC-4 via a master alarm, resulting in Commander Chris Ferguson heading over to the orbiter to evaluate the issue. The GPC in question was running system management software, although no root cause to the problem has yet been noted. However, it is unlikely to be related to the problem suffered by GPC-3 ahead of docking, when a switch tease related to when the computer was physically turned on during the set expansion task for rendezvous, caused the computer to temporarily join the common set prior to then failing out. GPC-3 returned to action via the IPL (Initial Program Load) and dump tasks – an effective reload of software into the computer – during the early part of Flight Day 4. Commander Ferguson spent 45 minutes transferring data from the troublesome computer into GPC-2 – aided by Ground Control (GG) in the Shuttle Flight Control Room (FCR) bypassing an expected period of Loss Of Signal (LOS) by working with with assets at White Sands in New Mexico – before being told he could return to his sleep period. The crew were then informed they would be awoken 30 minutes later than scheduled on Flight Day 8 due to the interruption. Updating the latest status of the investigation into the GPC issue, ISS Orbit 3 Flight Director Courtenay McMillan noted more information will be known when the crew begin trobleshooting during the first half of Flight Day 8. Around eight hours of transfer time will be lost during the troubleshooting, according to FD McMillan – although the crew was already 15 hours ahead of the mission schedule. However, the troubleshooting did not take long, wih GPC-4 successfully reloaded within a few hours and appears to be stable, as a root cause is evaluated (documentation on L2). Following an as-always impressive review of launch day imagery, Flight Day 2 (FD-2) TPS inspections of Atlantis via the Orbiter Boom Sensor System (OBSS), FD-2 Hi-Res photography of Atlantis’s OMS pods, and FD-3 R-bar Pitch Maneuver (RPM) photography of Atlantis’s underbelly TPS tiles, the Damage Assessment Team (DAT) have completed their extremely thorough review of Atlantis and cleared her for reentry into Earth’s atmosphere. With only 5 – yes, count them ONLY 5 – TPS notes, Atlantis/STS-135 will stand in history as being tied with sister Discovery as the second-cleanest orbiter to ever reach orbit: an honor she reached on STS-132 last year with only 4 areas of TPS damage – same as STS-131/Discovery. The honor of “cleanest” post-launch orbiter in the history of the Space Shuttle Program goes to Endeavour. She made it to orbit on STS-130 with only 3, yes THREE, TPS notes and absolutely NO lower-surface, underbelly TPS tile scuffs, dings, or scrapes. 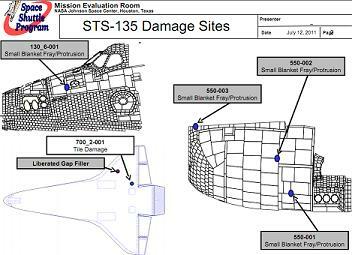 For Atlantis and STS-135, the DAT identified three (3) FI insulating blanket frays on the port OMS pod, one FI blanket fray on the forward -Y star tracker, and ONLY one underbelly TPS tile damage location. Launch pad cameras also captured the liberation of one AMES Gap Filler ~3seconds after liftoff from LC-39A last Friday. 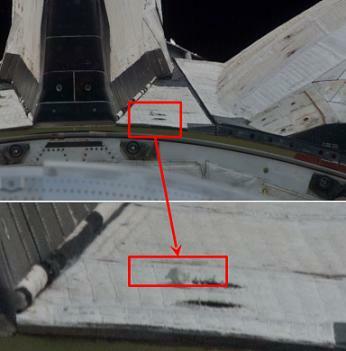 On orbit RPM photography of Atlantis by the ISS crew also confirmed mechanical and sensor evidence that both of Atlantis’s ET umbilical doors are properly closed and a good thermal seal present. Verification of closure of the two ET doors gives this system a PERFECT record throughout the 135 flight history of the Space Shuttle Program. Even more impressive here is that not only has the ET door closure system worked exactly as designed every single time, but that each and every Shuttle flight crew has undergone training for a contingency EVA to manually close the doors via a spacewalk underneath the Shuttle orbiter in the event that these doors ever failed to close properly. To begin their superb TPS clearance review, the DAT reviewed their characterization of the one TPS tile damage (more of a scuff) location. Further analysis showed the cavity more than acceptable for reentry – with a total damage area assessed at 2.5″L x 0.5″W x 0.84″D. Total tile thickness on the affected tile is 1.16″. 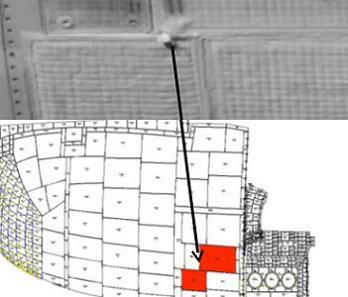 Nominal heating on this tile and its underlying structure is expected during reentry, and all aligned and cross-flow case evaluations will remain strongly positive. Cross-flow case evaluations revealed a conservatively estimated max 263-degree F temperature in the area. The max temp allowed is 350-degrees F.
Thus, this area will not be any concern during reentry next Thursday (July 21). The remaining four areas of interest for the DAT team were all thermal insulation blankets on the upper surfaces of Atlantis. 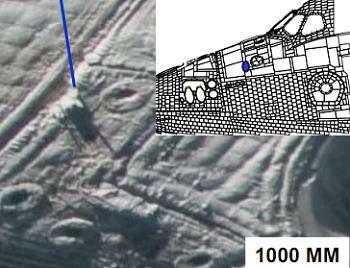 The only one of these blanket areas not located on the left OMS pod was on the nose of Atlantis near her -Y star tracker. “Frayed C/P Blanket Forward of -Y Star Tracker,” notes the DAT presentation. The damage dimensions are 2.59″L and ~1.13″H. Total blanket thickness is 0.75″ thick, and the blanket is an original build blanket making its first flight. The damage itself is between two previous stitch and coat repairs. Furthermore, the blanket was built to withstand the spreading of fray damage with quality stitches every inch. The fray has caused no loss of thermal protection characteristics, and ascent heat loads are significantly higher than entry loads on this area of the vehicle. No material liberation is expected during reentry, and the area is cleared for entry. The final three locations of interest were all on the port OMS pod, the first of which being the V070-396377-103 blanket. Installed on December 19, 2006 during OPF flow processing for STS-117, the blanket is making its 6th flight on Atlantis. The blanket itself is 0.92″ thick. The blanket edges in this area are stitched together to account for loose OML fabric, and – like the star tracker blanket – the blanket is designed to prevent the spread of a blanket tear. Ascent heating loads in this area are “significantly higher” than entry loads. There are no thermal protection loses because of the blanket deformation. No material loss is expected during reentry. For background on the FI blankets, “sleeving stitching is used for reinforcing blanket attachment to vehicle. 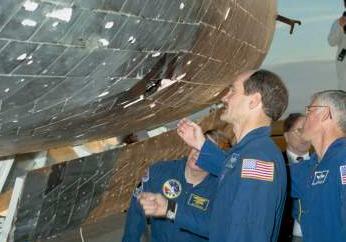 Sleeving securely attached and will not liberate,” notes the STS-135 TPS clearance presentation. Thus, there is no loss of thermal protection from “loose” stitching. 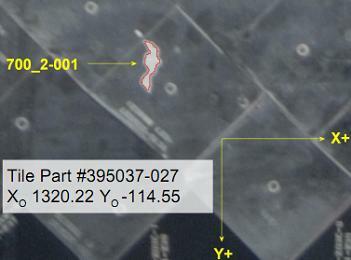 The fourth TPS area examined by DAT was a “small fray/protrusion” on the V070-396377-029 blanket. Total blanket thickness is 1.26″, and the damaged area is approximately 1.3″L x 0.9″H. 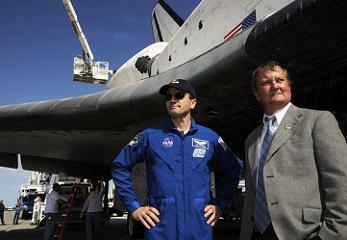 The blanket was installed on September 16, 2010 and is making its first flight on Atlantis. Again, the design of the blanket prevents the propagation of the fray, and all thermal limits are well maintained. The fifth and final TPS area looked at by the DAT was located right next to an APU exhaust vent on the port-side of Atlantis near her Vertical Stabilizer. 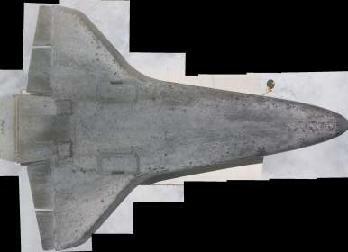 The blanket, which is 0.75″ thick, was installed on July 23, 1999 and is making its 21st flight with Atlantis. The blanket is still firmly attached to Atlantis and will not liberate during entry and landing ops next week. The final TPS item reviewed by the DAT, but not included in the five TPS damage location number, was an AMES Gap Filler liberation event at approximately 3 seconds after liftoff from LC-39A last Friday. 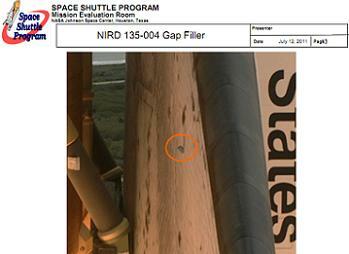 “Identified as protruding ~3 seconds post launch (V070-191011-131 / -132),” notes the TPS DAT presentation. Assessments show that there is no risk of increased heating in this area during reentry. Thus, all six TPS areas were reviewed by the DAT, and all areas were unanimously recommended for clearance for entry. The Orbiter Project Office reviewed this information and concurred with the assessment to clear the TPS for entry. The MMT reviewed this data as well and formally cleared the TPS for entry. Three of Atlantis’s four STS-135 crew members made their rookie flights aboard Atlantis: Chris Ferguson (STS-115), Sandy Magnus (STS-112), and Rex Walheim (STS-110). All three of Rex Walheim’s flights have been aboard the Atlantis: STS-110, STS-122, and STS-135. With this, Rex Walhiem has actually been a member of two of Atlantis’s three “final” trips to the ISS: STS-122 and STS-135. Sandy Magnus, with her flight on Atlantis/STS-135, is only the third astronaut to fly on all three orbiters (Discovery, Atlantis, and Endeavour) in the post-Columbia timeframe: STS-126/Endeavour (up to ISS), STS-119 (down from ISS), STS-135 (Atlantis). Steven Bowen (STS-126/Endeavour, STS-132/Atlantis, and STS-133/Discovery) and Garret Reisman (STS-123/Endeavour up to Station, STS-124/Discovery down from Station, and STS-132/Atlantis) are the other two astronauts to have flown aboard all three orbiters in the post-Columbia era. Atlantis is the only Shuttle orbiter to have had more than one “penultimate” and “final” flight. Her “penultimate” flights – at the time they were flown and with the addition of STS-135 – are STS-122, STS-129, and STS-132. Her first-last flight was STS-132. Her final-last flight is STS-135. Atlantis is the ONLY Space Shuttle orbiter to have never suffered a post-SSME (Space Shuttle Main Engine) start RSLS (redundant Set Launch Sequence) pad abort. The five post-SSME start RSLS aborts in the Space Shuttle Program were: STS-41D (maiden voyage of Discovery in June 1984 at T-6.4secs), STS-51F (Challenger in July 1985 at T-3secs), STS-55 (Columbia in March 1993 at T-3secs), STS-51 (Discovery in August 1993 at T-3secs), and STS-68 (Endeavour in August 1994 at T-1.9secs). Finishing her career tied with Discovery as the second-cleanest TPS orbiter ever, it is also notable that Atlantis is also the most TPS damaged orbiter to safely return to Earth. During her STS-27 mission in December 1988, standard post-launch imagery review revealed that portions of ablative insulation on the right hand Solid Rocket Booster (SRB) nose cone had liberated 85 seconds after liftoff and impacted the right hand side of the Atlantis, causing significant TPS damage. From the images transmitted during the mission, it was determined that the damage was no more severe than on previous missions. Upon landing on December 6, 1988, over 700 TPS tiles were found to be damage, and one tile was completely missing. 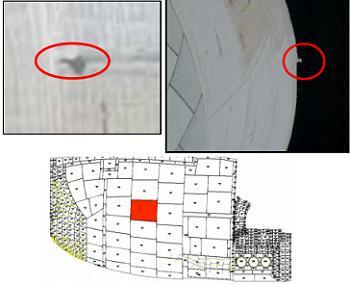 Luckily, and perhaps the only thing that prevented a burn through at the area of the missing TPS tile and the loss of Atlantis and her flight crew was the fact that the missing tile was located over a dense aluminum mounting plate for the L-band antenna – which provided some degree of “added” protection against a burn through. Additionally, on the occasion of Atlantis’s real final flight, she has become the only Space Shuttle orbiter to carry an iPhone (smart phone) into orbit – thus linking the most complex machine ever built (the Shuttle orbiter) with a new generation of hand-held computing technology. (Images: Via L2 content, L2’s 600mb STS-135 400mm, 800mm, and 1000mm hi res photo collection – and NASA.gov. Further articles on STS-135 will be produced during and after her mission, driven by L2′s STS-135 Special Section which is following the mission at MMT/MER level, surrounded by a wealth of FRR/PRCB/MER/MMT and SSP documentation/pressentations, videos, images and more.